On NBC 5 Investigates: the death of an Illinois State trooper drew outrage from across the state after it was revealed that the man behind his death had a lengthy criminal record, but was out of jail. The question now, is why? NBC 5 Investigates' Phil Rogers has been asking State's Attorney Kim Foxx that very question. 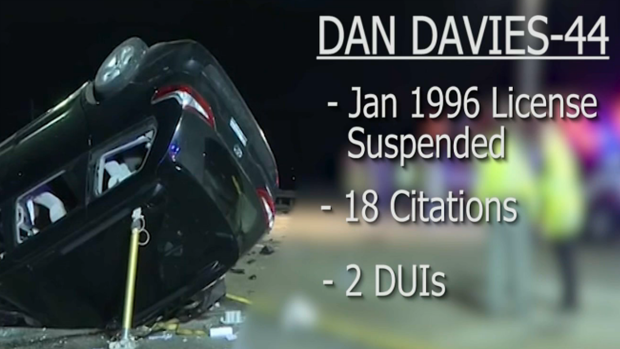 A lengthy troubled driving history was uncovered for the man police say drove the wrong way and killed a state trooper this weekend. In fact, his license was revoked at the time of the accident. NBC 5's Phil Rogers investigates. •	What prosecutor or prosecutors in the state’s attorney’s office handled Davies’ case? •	In particular, what prosecutor or prosecutors in the state’s attorney’s office handled the bond portion of Davies’ case? •	What did those prosecutors originally recommend as Davies’ bond (if any)? Did anyone recommend that he be jailed? •	What judge or judges handled the bond hearing and ultimate decision on bond? •	Who ultimately recommended the $3,000 I-bond? If it was recommended by the state’s attorney’s office, please tell me who was involved. •	Even if it was not someone in the state’s attorney’s office who ultimately recommended the $3,000 I-bond, please tell me who, in the state’s attorney’s office, ultimately agreed to this bond; how the final decision was made; and how Davies’ criminal and traffic history may (or may not) have factored in to the granting of this bond. •	Was there any consideration of other options for Davies’ release, in addition to this bond – for example, electric monitoring or some other kind of monitoring?